Oven roasting brings out the sweetness in the root veggies in this easy recipe for roasted carrots with parsnips and herbs. This recipe, from "Gourmet Meals in Minutes" (Lebhar-Friedman Books, 2004), comes together in about 45 minutes. Cut the vegetables the same size, and they will cook in the same amount of time. 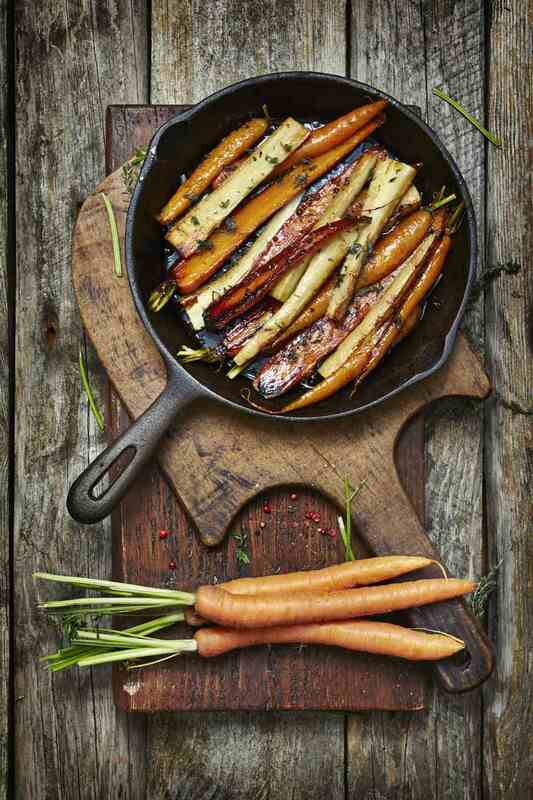 Serve this roasted carrots and parsnips dish with roasted poultry or roasted meats. Recipe reprinted with permission from Gourmet Meals in Minutes (Lebhar-Friedman Books). Heat oven to 350 degrees. Halve each of the 4 peeled parsnips crosswise where it becomes narrow. Diagonally cut the narrow portions into 3/4-inch thick slices. Quarter the wider portions and diagonally cut them into 3/4-inch thick slices. In a large bowl, toss parsnips, and 5 peeled carrots cut diagonally into 3/4-inch thick slices with 3 tablespoons olive oil, 1 teaspoon salt or to taste, 1 teaspoon pepper or to taste, 2 teaspoons chopped fresh rosemary, and 2 teaspoons chopped fresh sage. Spread mixture in a large shallow baking pan and pour in the 2 tablespoons water. Roast vegetables in lower third of oven until tender, about 30–35 minutes. Root vegetables are precisely that -- plants whose roots are used as food. In some cases, not only is the root eaten, but the green leafy part as well. And they're good for you! Because root vegetables grow underground, they absorb tons of nutrients from the soil making them packed with antioxidants, vitamins C, B, A, and iron, and slow-burning carbohydrates and fiber, which make you feel full, and help regulate your blood sugar and digestive system. Root vegetables include carrots, beets, rutabagas, turnips, kohlrabi, horseradish, burdock, celeriac, daikon, jicama, parsnips, parsley root, radishes, yams, sweet potatoes, potatoes, garlic, onions, scallions and a lot more. Local varieties are available typically only from fall through spring, except for beets which are the best summer through fall. In-season roots have a deeper, sweeter flavor and are juicier. But, these days, root vegetables are available year-round from warmer climes. When choosing root vegetables, Oh My Veggies says to use the opposite strategy you'd use for fruit. In other words, the harder the root, the better it will be. They should be smooth and free of gashes or bruises. For roots with leafy greens, (beets, for example), make sure the stems and leaves are firm and bright. Root veggies are best stored in a cool, dark, humid room (like a root cellar!). When storing them in the fridge, keep them in a paper or plastic bag in the crisper. Storing them uncovered causes them to soften and go bad quickly.